This page is for people who attend NHS Tayside Specialist Diabetes Clinics who are seeking NHS Tayside-funded Freestyle Libre use. If your child attends the Paediatric Diabetes Specialist Service then the Paediatric Diabetes Team will be writing to you directly regarding access to Libre. Please await this correspondence and do not contact the team directly regarding Libre. If you attend the Adult Specialist Diabetes Service, please follow the five steps outlined below. Have attended a recognised diabetes structured education programme and/or clinical team are satisfied that the person (or carer) has required knowledge/skills to self-manage diabetes. 1. Are you eligible for NHS Tayside funded Libre? (* Background insulin - Lantus, Levemir or Tresiba; Quick-acting insulin - Novorapid, Humalog, Fiasp or Apidra ). If the answer is yes, you are highly likely to be eligible for funded Libre use. The full Scottish Diabetes Group eligibility document can be viewed by clicking here. If you think you are eligible and would like to use the Libre system the follow the steps below. If the answer is no, if you are on twice daily insulins (e.g. humalog mix 25, humulin m3 & novomix 30) you are not currently eligible. If you would like to consider changing to multiple daily injections of insulin, this can be discussed at your next clinic appointment. This is a series of interactive tutorials provided free of charge by Abbott (the manufacturer of Libre). You MUST complete this before attending a local education session and will be required to evidence this by bringing along the completion certificate to the session. 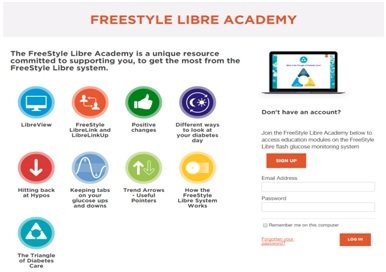 This can be accessed by clicking the image below (sign up required): https://freestylediabetes.co.uk/freestyle-libre/academy. This is important as you will be expected to have this information and knowledge when you attend the local education session. Please read the Patient Partnership Agreement (click here) so you understand the standard of care you can expect from your diabetes team, and also what your team will expect of you if you receive NHS funded Freestyle Libre. Please ensure you have read this before coming to the local education session as you will be asked to sign a copy at the session. Education sessions lasting 90 minutes will be delivered by members of the Tayside specialist diabetes team. They will take place either in the Strathmore Diabetes Centre, Ninewells Hospital or at Perth Royal Infirmary. 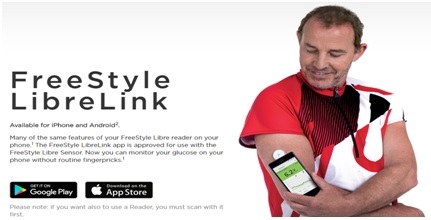 We are striving to deliver Freestyle Libre education to as many people as possible - as soon as possible. We are asking everyone to everyone to use Eventbrite to book a place on the local education session. Failure to bring these may result in you not being able to participate in the education session and your start on Libre being delayed. Before coming to the education event please download the LibreLink App on your phone (click the image below to be taken to Abbott's website for further information) and create an account. If you don't have an android phone or iPhone 7 or above, please still sign up to LibreView as you can use this with the provided Libre Reader. IMPORTANT: The account you create on Librelink is also how you log in to Libreview (the webpage to review your glucose results). We look forward to seeing you at one of our education sessions. After you attend, a letter will be sent to your GP recommending prescription of Libre sensors. Now that you've started using Libre? If you are having technical problems with your Libre (sensors falling off early / inaccurate sensors etc.) please contact Abbott Customer Care: 0800 170 1177 - your GP / Diabetes team/clinic cannot help with these matters. If your problems relate to difficulties using the Libre, understanding the results or for general advice on improving diabetes control, please contact the diabetes nurse specialists (Ninewells 01382 632293 or Perth 01738 473476). 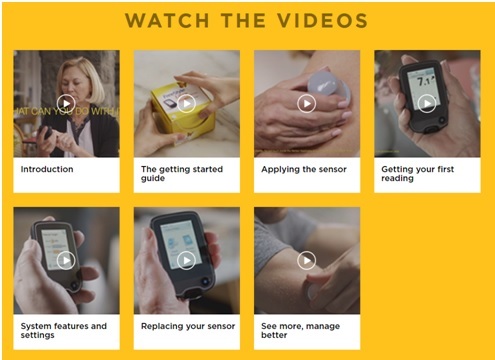 Click on the image below to view instructional videos from the manufacturers website - viewing these videos is HIGHLY RECOMMENDED for people who have never used / applied a Libre sensor before. If you attend the Tayside Specialist Diabetes Service but live in Fife Health Board/Council area then your prescritions are funded by NHS Fife. At this time (October 2018) the criteria for NHS Fife funded Freestyle Libre are for people with Type 1 diabetes only. This will be revised if the position changes. If you wish to raise this further please contact NHS Fife directly.